Shoulder girdle exercises can increase shoulder stability, which is an essential base for good handwriting. Many children who struggle to control a pencil effectively and whose fine motor skills are poor, lack good stability and control of their shoulder girdle muscles. Elsewhere on my site, I explain the importance of shoulder stability as a base for fine motor skills and I give a few free easy shoulder exercises. Click on the gross motor tab on the left side of my page and follow the links there. 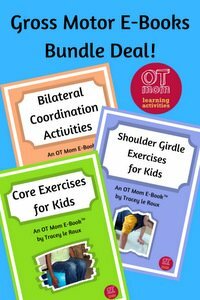 But if you are looking for more shoulder exercises that you can do at home with your child, then this e-book is for you! Why is this e-book not free? NOTE: The e-book is in PDF format, which makes it easy to read on your PC or tablet, or to print out as you wish! A few of these exercises are replicated in the Core Exercises E-book as they work on both the core and shoulder girdle muscles. For this reason, I offer both e-books as a bundle at a reduced price. However, there are still lots of unique exercises in this e-book to make it worth the price! What Is Special About These Exercises? 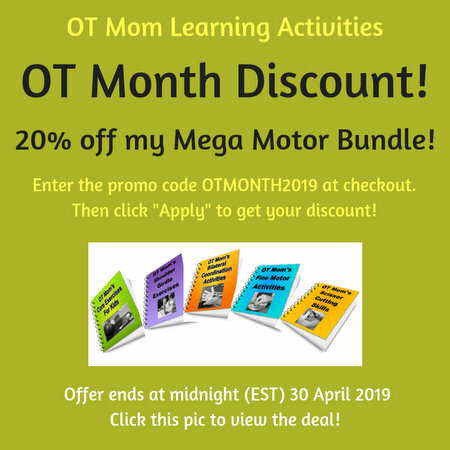 While working as a pediatric OT, I had years of experience working with kids in schools as well as in low-income communities.This helped me seek out activities that were easily done with minimal equipment. 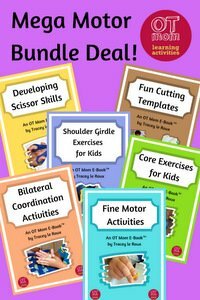 As a homeschooling mom, my own kids have needed to implement regular shoulder stability exercises to improve their fine motor development, so I have used all of these activities with them. With this in mind, I have chosen activities that are easily replicated in the home or neighborhood park and use a minimum of equipment. As with all the activities on my website, real-life photos accompany the instructions. For the price of a couple of coffees, you can have easy access to a range of exercises for your child. Use your credit card to pay through PayPal, or use a PayPal account. South African? Pay in ZAR by EFT! My e-books are not free, as I need a source of income to maintain this website. I have kept the prices as low as possible, but if you genuinely cannot afford an e-book, and need more than the free exercises that I already offer on my site, then feel free to contact me to explain your situation. Thank you for your interest in my e-books!